As many of you know, one of the ways we keep orphaned babies wild before release is by using foster parents. For years now many bobcat kittens have been raised by Mr. and Mrs. Foster. 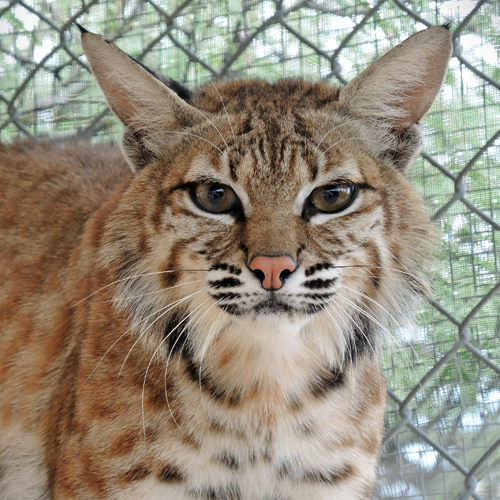 Both were adult bobcats too injured to survive on their own and so became permanent sanctuary residents. This year we lost Mr. Foster to cancer, and Mrs. Foster is raising babies on her own. It’s a big job and she’s not a young cat anymore. It was time to look at our sanctuary residents for another possible foster parent, and we think we’ve found her! Meet Dizzy. This bobcat came to SWCC in 2014 as an orphan. In fact, she was raised by Mr. and Mrs. Foster! However, when her release date arrived, we were troubled by what appeared to be neurological issues, such as a head tilt and occasional circling. After much research and many medical tests, we could find no certain cause for her oddities, but felt she would not be a good release candidate. Fortunately for Dizzy, her neurological issues have improved. As she has matured, rather than becoming friendly, she’s become less tolerant of people. Her desire to avoid people is what we want young bobcats to experience. Having decided to give Dizzy a try at fostering, we moved two nervous little bobkittens into the area next to her. After a few days of living side by side, we opened the shifter between them. It was a tense moment; no one knew how she would react. Dizzy immediately hopped over into the kittens’ area and was mobbed by two mewing, happy kittens! What did she do? She reacted like a mother! Interested, patient and protective. Amazing, just amazing! Our fingers are crossed that this arrangement will continue to go smoothly, that Dizzy will enjoy the company of the kittens, and they will learn important bobcat manners and lessons that only another bobcat can teach them. 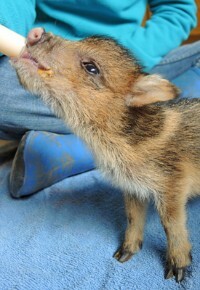 The monthly support we receive from our Wild Family group helps to make these small miracles possible!